Hello. We are Sean Mongey and Jennifer Macpherson, Owners of Mathnasium of Guelph, your neighbourhood math-only learning centre. We help kids in grades 2-12 understand math by teaching the way that makes sense to them. Our team is passionate about math education and about helping your child catch up, keep up and get ahead in math through both year-round and summer-only math programs. Since we opened in 2017, Mathnasium of Guelph has been helping students in the community increase their confidence in math. We are located on Clair Road East. Come and visit us at the Centre for a FREE Trial and see how we can help your child become CRAZY about math! The staff at Mathnasium work with and encourage our child in a way that helps him progress. Even though we focus on what may be considered remedial or basic math, we see a difference even just a few months in. Continued use of Mathnasium will help our child form a stronger foundation, and result in possibly catching up with his peers. As long as my child makes no excuses not to go to math I am happy. She loves to see the progress she's making, and how she's applying her skills in school. My child enjoys going,and loves seeing her progress. We love Kim! She is amazing. My girls also really like Drew. He is approachable and funny so they feel comfortable with him. We have told many friends about Mathnasium. The program has really helped our son. We have seen great improvements since he started. The staff is awesome! We love Mathnasium. My daughter has been attending Kumon for 2 years when we won 1 free month of Mathnasium at a school fundraiser. We decided to try it and took her there. She loved it immediately. She could have help from tutors whenever she needs it. There are multiple tutors every night so kids don't wait long for help. They cover the Canadian curriculum and they help with math. My daughter has ADHD and LD in math and we had enrolled her in Kumon to help her. Kumon is great for repetitive work which is needed for kids with ADHD, but there is no help from the tutor. Kids are expected to work on it themselves and the owner of the franchise helps from time to time, but needless to say, it is 1 to 40 students at a time. The place is noisy and dark. It takes my daughter often an hour to complete her sheets that take 10 min. Mathnasium is bright and cheerful, there are math decals on the walls and the kids get points and rewards for doing their work. Mathnasium is open 6 days a week!!!! That's amazing! We can bring my daughter any day of the week we want! The most I have seen at a time is 6-7 kids and 3-4 tutors. That's an amazing ratio and I know we don't hit the busiest times, so I do like the fact there are lots of tutors and kids do not have to wait. Do I need to continue? I have recommended Mathnasium to both my daughters' friends parents and to anyone who hears we take her to Mathnasium. And I will continue to do so as the service you deliver is amazing! Mathnasium has released the stress around maths in my house. It is very difficult to teach your own kids, especially when your method is different from the one used by teachers these days. My daughter is learning and reviewing concepts that she hasn't learned in the past and she is enjoying going to the center!! Mathnasium is worthy! Very caring one on one help flexible schedule and can stay as long or short as we like. The instructors have great patience with my son which is super helpful because his attention span is very short. With continued support we hope he will make good progress. We also hope to get to a point where he can be there at least 2-3 days a week. The ability to drop-in provided us with the scheduling flexibility that our busy lifestyle requires! My daughter actually looked forward to going, the teaching style resonated so well with her. She feels much more confidence and has told us that she IS good at math, which she didn't believe when we started. Thank you and we will continue and share our positive experience with our friends. Great math tips and motivational tools! My child always looks forward to not just completing her assignments, but to get involved with the math games. Thanks! 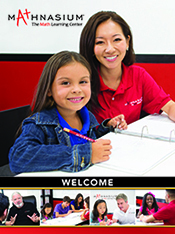 Great friendly tutors. Very flexible hours. Worth the cost. We just wanted to give you a big big THANK YOU for all the care Sage received during her time at Mathnasium. Not only did she advance and improved her Math skills, but she also LOVES math and is consistently using her knowledge at home, in the street and everywhere she goes. Thank you for always taking the time to talk to me or email me when I had questions or concerns. We are avid advocates of Mathnasium. We will continue to support you guys as a Thank you for having changed Sage’s perspective in Math. I highly recommend this program to any kid. Unbelievable transformation im our child in such a short amount of time! She genuinely looks forward to her time at Mathnasium. We have only been at the center for one month but so far the experience has been great. Everyone is so friendly and my son doesn't feel uncomfortable or intimidated. Really looking forward to seeing his progress! Truly appreciate the focus to get to know each child and their individual needs, such that programs and support are geared towards each child. My child has a new profound understanding of math. He use to dislike math and now he likes math! He's no longer nervous but more confident in his abilities. Flat Ace Around the world!